If I didn’t like him so much I’d accuse Idris Elba of hogging the media limelight. In the last year he’s become one of the most talked about actors in Hollywood. It’s partly due to his ruthless schedule, with new projects to promote every few months and his diverse career which includes acting, singing, DJing and presenting. The latest buzz is the speculation that he’s up for the role of James Bond. According to actress Naomie Harris Elba has met with movie chiefs to discuss becoming the next 007 when Daniel Craig stepped down. Of course Elba is shying away from the ‘first black bond’ label but if the attention this latest rumour has received is anything to go by, he’s an overwhelmingly popular choice. They’re not as well known in the UK but somehow the Kardashians believe there’s a market for their brand of fashion over there – and in Dorothy Perkins of all places. Kim is currently in the UK, along with her sisters Khloe and Kourtney, promoting their new Kardashian Kollection. The range features more than 100 pieces in sizes 8 to 16, and is apparently designed with the ‘British girl’ in mind. Well, we’ll see what those British girls think when the sisters meet fans at the West London Westfield shopping centre on Saturday. Poor Pippa. Her attempt to raise her US profile doesn’t seem to be going too well after the recent release of her new party planning book ‘Celebrate’. Kate Middleton’s younger sister was reportedly paid $650,000 for the 416-page book based on her experience working for the Middleton family's online party business, Party Pieces, and for a London events-planning outfit, Table Talk. But her tips have been called obvious and simplistic by the British press prompting Pippa to write a subtly defensive essay in British paper, The Telegraph, about her skills and reasons for creating a book that is simple and comforting. Anglophiles will love it as it’s packed with traditional British classics like Toad-in-the-hole and Easter Trifle but it’s also based around holidays that aren’t widely celebrated in the States and with no US press or interviews (not even Oprah!) 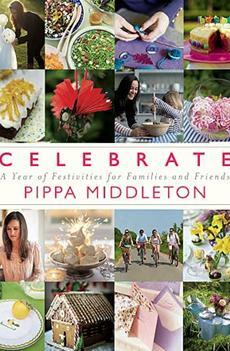 ‘Celebrate’ may fail to resonate with American foodies.